Are you worried your body won’t tolerate gluten? I’ll help you identify gluten intolerance symptoms, then if necessary, help you discover a delicious new world of gluten-free cuisines. Being gluten sensitive shouldn’t stop you from living a healthy, happy life. While there are several gluten-related disorders, none of them should stop you from being healthy and active once you’re empowered with knowledge and understanding. Please don’t view your newly discovered intolerance or sensitivity as the dawn of a darker day. I will help you restore hope. I’ll try to keep this as comprehensive yet accessible as possible, but this isn’t a simple topic and if you’ve read simple summaries somewhere else, it’s possible you’ve been left more in the dark than you realize. I’m not trying to persuade everyone to try a gluten-free diet; this lesson is for people with real medical concerns. What Are Common Celiac Disease Symptoms? Can Adults Develop Food Allergies or A Food Intolerance? I’ll help you understand the difference between symptoms of a wheat allergy and the symptoms more discretely related to celiac disease. Many mistake these separate phenomenons to be the same, but they’re not! Please note this guide does not use the words wheat and gluten interchangeably as they are not the same thing. Also, it is possible to experience celiac disease symptoms but test negative for celiac disease. Additionally, you may see the term gluten allergy used, although the terms gluten intolerance, celiac disease, non-celiac gluten sensitivity (NCGS) or wheat allergy are all more accurate and meaningful than the layman term gluten allergy. Gluten is not a protein itself but rather a protein composite, which means it is composed of several different proteins. The primary proteins giving gluten its utility in baking and its difficulty in health are glutenin and gliadin (in wheat), secalin (in rye) and hordein (in barley). These are elastic proteins in the protein family known as prolamins. 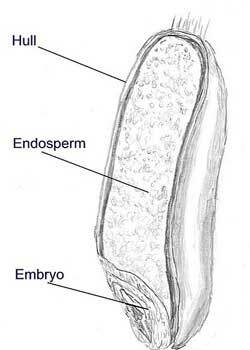 This unique protein composite is insoluble in water and comes from the endosperm (see the accompanying illustration) within the seeds of grass-related grains. Gluten exists in the grass-like grains wheat, barley, rye, kamut and spelt. It provides an elasticity and glue-like capacity to hold its flour products together and provide them with a chewy texture. Some argue that other grains — including rice, corn and oats — contain some form of gluten, even if they do not share the profile of peptides associated with any form of gluten sensitivity. Others argue that the peptide sequences in these grains do not have the unique qualities that define gluten as it is widely understood, particularly as it is understood in wheat. For the sake of studying gluten intolerance, these other grains are considered safe as their protein profiles do not match the profiles of the troublesome grains. Oats, however, usually must be avoided because oats are often harvested and processed alongside wheat and thus may be cross-contaminated. In some rare cases, even oats guaranteed to be gluten-free may trigger cross-reactivity in celiac patients. You can see how defining this complex protein composite in a concise manner can be a challenge. While western civilization has come to rely on gluten not only as an important nutritional protein but also as a utility for obtaining a desired texture and elasticity in foods, in recent years some substantial and controversial studies suggest our bodies may not tolerate and digest this unique protein composite as well as everyone had always assumed. It is worth noting that some people believe this applies to everyone, and not just people suffering from some degree of sensitivity. One key point to consider is that gluten is in more foods and products than you may realize. If you think removing gluten from your diet involves just avoiding bread and baked goods, I’m afraid you’re mistaken. It is often used in sauces, flavorings, flavor enhancers and even as a binder or filler in medications, vitamins and supplements. Adapting a true gluten-free diet requires more than just removing wheat products from your lifestyle. I’ve read many vague and inaccurate answers to this question, so I’ve written my own guide to this deceptively simple topic: What Is Gluten? If you’re sure you can answer this question accurately, I challenge you to take the quiz at the end of that lesson. To put it bluntly, most people don’t understand this topic as well as they think they do. Celiac Disease occurs when the proteins in gluten (glutenin and gliadin, but primarily gliadin) trigger your immune system to overreact with strong and unusual antibodies. Over time, the reaction caused by these antibodies wears down the villi that line the walls of your intestine (this process is called villous atrophy). 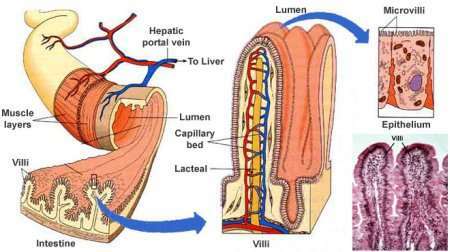 The villi, which are finger-like protrusions along the wall of your small intestine, grab and absorb nutrients as foods pass through your lower digestive tract. As this autoimmune response slowly flattens the villi, you become less and less able to process any nutrition from your food. Celiac disease also triggers inflammation of the intestinal wall. The combination of absorption-killing villous atrophy and inflammation sets off a domino-effect of increasingly serious health problems. Celiac disease is also associated with leaky gut syndrome (intestinal permeability or intestinal hyperpermeability). Undigested proteins and toxins either get stuck within the wall of the small intestine or move through the intestinal wall and into the bloodstream. This may be the cause of conditions like dermatitis herpetiformis (Duhring’s disease), a nasty gluten intolerance rash. In fact, since I originally published this lesson several years ago, doctors and researchers have become more concerned about the relationship between a leaky gut and a variety of autoimmune diseases. Wheat allergy symptoms create the second category. The triggers of wheat allergy symptoms are fundamentally different from the triggers of celiac disease symptoms, but some might inaccurately refer to them as gluten allergy symptoms. A wheat allergy is a histamine response to wheat, much like a peanut allergy or hay fever. Wheat allergies manifest themselves in many ways, which can be quite different for different people. Some people experience hives while others might experience stomach pain. A wheat allergy, unlike celiac disease, is considered a Type 1 Hypersensitivity. It is important to make this distinction: celiac disease is not a Type 1 Hypersensitivity and celiac patients consuming gluten may not experience immediate pain or discomfort. Someone with a wheat allergy, however, will experience problems soon after they eat wheat. A wheat allergy may also sometimes occur as a cross-reactive condition related to an Oral Allergy Syndrome (OAS), which some people refer to as Pollen Foods Allergy Syndrome. This can also cause stomach pain that might be interpreted as gluten intolerance. For more on that matter, try my recently added lesson: Oral Allergy Syndrome. Non-Celiac Gluten Sensitivity (NCGS) is currently a little more difficult to pinpoint. Basically, individuals who suffer from NCGS suffer similarly to people with celiac disease, but the blood test and biopsy used to identify and diagnose celiac disease is negative. Non-Celiac Gluten Sensitive patients also test negative for a wheat allergy. The only way to confidently diagnose NCGS is through deduction (a patient tests negative for celiac disease and a wheat allergy) and through a gluten challenge, where this pesky protein composite is removed from the diet for a period, then slowly re-introduced while changes in health and symptoms are observed. NCGS only became officially accepted by large swathes of the medical community when it was verified as a distinct condition in early 2011, although many of us referred to the term and the condition for several years before its official acceptance (I’ve referred to NCGS on my site since 2007). Update: Some recent research suggests this previous study identified individuals suffering from an intolerance to certain FODMAPs, not non-celiac gluten sensitivity. What are FODMAPs? “Fermentable Oligo-, Di-, Mono-saccharides And Polyols,” or short-chain carbohydrates. Wheat contains short-chain carbohydrates, so this may still be considered a form of gluten intolerance. I will soon add a new lesson addressing this topic. Recent research and current gluten intolerance statistics suggest that 10% to 15% of the population may suffer from some form of intolerance to this troublesome protein complex, and yet a vast majority of these individuals have not yet been properly diagnosed. Furthermore, we now know even patients who test negative for celiac disease may suffer from some form of undiagnosed non-celiac gluten intolerance. Even as recently as 2010 some of these NCGS patients may have been excluded from a gluten-free diet just because they tested negative for both celiac sprue and a wheat allergy. It may help you to have a more succinct gluten intolerance symptoms checklist. I will try to provide you one here, but keep in mind how there are over 250 documented symptoms of celiac disease alone and their manifestation varies greatly from person to person. If you include non-celiac gluten sensitivity symptoms, the list grows even longer. With this list I think I have isolated both the most common symptoms and the most important symptoms you should know about right away. Some symptoms are rare and even counter-intuitive (for example, gluten intolerance and weight gain goes against the grain of what most doctors expect). Please let me know if you feel I have missed something obvious or important. I hope this gluten intolerance checklist helps you, but again, do not try to diagnose yourself with a list you find on the Internet. Always consult a professional because this is a very serious condition. For a more focused list designed to help you work with your doctor in diagnosing a possible case of celiac disease, use my celiac disease Symptoms Checklist. One condition with a controversial connection to gluten intolerance is Autism. Many people feel a gluten-free, casein-free diet (often abbreviated as GFCS diet) helps reduce the manifestations of autism or Autism Spectrum Disorders (ASDs). Some people strongly believe autism itself should be counted among the many signs of gluten intolerance. However, the support for this hypothesis is mostly based on anecdotal evidence, with several recent studies indicating little to no connection between gluten and autism. Put simply, the hard science is weak here, but many people are still staunch supporters of treating autism with a gluten-free, casein-free diet. Despite what many people believe and misunderstand, celiac disease is not a food allergy, so it may not cause the immediate and severe reaction people associate with food allergies. In fact, one dangerous aspect of celiac disease is how it can be latent or silent. When someone with celiac disease eats gluten, that person may not experience obvious, tangible symptoms; but the damage is still being done. Clinical celiac disease and non-celiac gluten sensitivity are fundamentally different from an allergic response. An allergy is a Type 1 Hypersensitivity that produces a different, more immediate response in our bodies than an intolerance or an autoimmune disease. Celiac disease is an autoimmune disease, a Type IV Hypersensitivity. The nature of a non-celiac gluten sensitivity is still being researched and debated, but currently it is considered to be somewhere in between, and still not an allergic response. Even though it occurs as an immune reaction to proteins in wheat, celiac disease is not a wheat allergy. A wheat allergy — like most well-known allergies — involves the response of white blood cells called basophils and mast cells to something called Immunoglobulin E (or IgE for short). Again, a wheat allergy is type 1 hypersensitivity, but celiac disease is a type IV hypersensitivity. A type IV hypersensitivity is sometimes referred to as a delayed type hypersensitivity or cell-mediated response. Believe it or not, you can have a wheat allergy and not have celiac disease, and you can have celiac disease and not have a wheat allergy. They’re two completely different immune responses in your body. In a vast majority of cases, celiac disease and gluten sensitivity symptoms will be systemic and will be a result of consuming gluten over a period of time. But symptoms of a wheat allergy will manifest themselves in a manner more typical of an allergic reaction: immediately or almost immediately after consuming the wheat-containing culprit. For example, if you eat a large, dense piece of gluten-rich bread and have immediate reactions, you are more likely experiencing wheat allergy symptoms rather than symptoms of celiac disease. I know this can be confusing, but think of a wheat allergy reaction as similar to the way a person might react to cats if he or she is allergic to them. If he pets the cat and breaths around the cat, then he will almost immediately start having watery, itchy eyes and begin sniffling and sneezing. An even more relevant example could be a peanut allergy. Often people with a peanut allergy can’t even come into contact with peanuts — or even peanut residue — without having an immediate, severe reaction. That is a type 1 hypersensitivity, an allergic reaction. In contrast, gluten intolerance symptoms manifest themselves more like a growing nutritional deficiency, with symptoms that sometimes arise slowly over time. The symptoms can be severe and serious, but in most cases they’re systemic, not immediate like symptoms of wheat intolerance. To make this even more confusing, people frequently refer to this condition as gluten allergy symptoms. General gastrointestinal distress or separate, additional digestive disorders are also triggered by gluten intolerance. For example, some symptoms of Candida may develop as a result of gluten intolerance. It may sound like I’m being redundant in some parts of this lesson, but this is critical to understand because someone who eats gluten and experiences no immediate or apparent reaction could still be suffering from celiac disease, which is a serious medical condition with very serious long-term consequences if left untreated. The cold clinical definition to a celiac sprue disease diagnosis is this: Positive antibodies to the proteins glutenin and gliadin, tissue transglutaminase, and intestinal endomysium, along with the verified presence of HLA-DQ2 or HLA-DQ8 genes. Fun, huh? Such an explanation doesn’t exactly insinuate celiac symptoms. celiac disease is caused by the inflammatory interaction of gliadin — a gluten protein in wheat and other grains such as barley and rye — and the enzyme tissue transglutaminase. This inflammation flattens the lining of the small intestine and thus impedes your small intestine’s ability to absorb nutrients. This inflammation also triggers pro-inflammatory cytokines, which then course through your veins and cause inflammation in other parts of your body. If you and your doctor determine your problems are distinctly a result of consuming gluten, you may be diagnosed as having celiac disease. Celiac disease is an autoimmune disorder of the small intestine. It can rear its troublesome head at any point from infancy to old age. Celiac disease is an inherited autoimmune disease. However, as it has often gone misdiagnosed or undiagnosed in the past, you may have gluten intolerance in your family and not realize it. Thankfully, people are becoming more sensitive and aware of gluten intolerance in children so gluten intolerance symptoms in children are now much more likely to be diagnosed than they were just ten years ago. Gluten intolerance symptoms in adults, however, are still somewhat nebulous as they often dovetail with conditions such as ulcerative colitis, Crohn’s disease, lactose intolerance, irritable bowel syndrome and yeast intolerance. And because adults too often grow accustomed to some discomforts as they age, celiac disease symptoms in adults often go undiagnosed and untreated. It is important to recognize that clinical tests (a blood test and/or an intestinal biopsy — note that the biopsy is the gold standard for diagnosis) can determine to some certainty that you have coeliac disease, but inconclusive or negative results in these tests do not necessarily mean you’re free from some form of wheat gluten intolerance. In fact, most people experiencing legitimate and significant sensitivity symptoms have officially tested negative for celiac disease. Most of these individuals are categorized as Non-Celiac Gluten Sensitive, however, some may suffer from other forms of non-celiac gluten intolerance, including a wheat allergy, dermatitis herpetiformis or gluten ataxia. The only way to treat coeliac sprue disease is to adapt a vigilant and strict gluten-free diet. Thankfully, gluten-free foods are much more widely available than they were a decade ago. Update: Please note that information on gluten intolerance vs celiac disease is undergoing quite an evolution right now. Please see my gluten intolerance test lesson for more on this matter. For example, testing for steatorrhea, or excess fat or lipids in one’s stool, has become part of a more rigorous gluten intolerance test and examination of one’s overall gluten sensitivity. Because it is difficult to test conclusively, many people will be diagnosed based on a wide variety of screenings and observations. The most common symptoms are gastrointestinal problems (or gastrointestinal distress) such as diarrhea, flatulence, gas and bloating. Other symptoms may include joint pain, fatigue and headaches, but many other peripheral symptoms may also lead to a celiac disease diagnosis or a diagnosis of a non-Celiac gluten sensitivity, such as gluten ataxia. Keep in mind that currently there are an estimated 250 or more symptoms or conditions related to gluten intolerance or celiac disease and many of these symptoms may overlap with other diseases and conditions. While you will often see celiac disease symptoms such as constipation, diarrhea, gas, bloating, fatigue and joint pain mentioned as the most common celiac disease symptoms, these symptoms can occur with dozens of other diseases and ailments as well. Always consult a medical professional rather than attempt to diagnose yourself. In some cases, these may manifest as silent celiac disease symptoms and go undiagnosed for years. Some believe the most accurate way to identify and diagnose your condition is to use an elimination diet, a strict diet where you completely eliminate gluten and all foods containing gluten for a significant period of time, then use careful record-keeping and observation to compare your symptoms before the elimination period to your symptoms after the elimination period. Be mindful of the placebo effect. But gluten-free diets can be difficult for the uninitiated, so doctors often like to evaluate a patient’s condition thoroughly before prescribing a gluten-free diet. More importantly, however, if you remove this frustrating protein composite from your diet for a significant amount of time, your doctor will have difficulty testing you for celiac sprue disease because your body may not have the antibodies triggered by our least favorite toxic protein. So many people feel it is important you discuss allergy and intolerance testing with your doctor before you attempt to isolate your symptoms with any kind of elimination diet. Defining a gluten allergy has been a surprisingly tricky matter for me. When I first began this website, I avoided using the term at all. Why? Because it is technically incorrect and even misleading. Celiac disease and gluten intolerance are not allergies. As I’ve mentioned, an allergy is a Type 1 Hypersensitivity and involves IgE antibodies (Immunoglobulin E) and a histamine response. While a wheat allergy is an allergy, celiac disease, dermatitis herpetiformis, gluten ataxia and non-celiac gluten sensitivity are not allergies. Celiac disease is a Type IV Hypersensitivity, also sometimes referred to as a delayed type hypersensitivity or a cell-mediated response. However, an overwhelming number of people in the real world use gluten allergy or gluten allergy symptoms in place of any of these other terms. You find it in major media outlets, in discussion forums and on gluten-free blogs. When I researched how often people use different terms to search the internet and when I researched the occurrence of different phrases in all news outlets, I found the terms gluten allergy and gluten allergy symptoms used far more often than celiac disease, gluten intolerance or gluten sensitivity. The term gluten allergy can also be misleading because to most lay people it implies an immediate response to consuming gluten. One of the most dangerous and insidious aspects of gluten intolerance is how silent celiac disease symptoms can occur or how people can have asymptomatic celiac disease (meaning, they don’t experience any apparent symptoms at all). For many people the term gluten allergy implies you should experience an immediate and tangible reaction to eating food with gluten. This is inaccurate, and if people with a gluten intolerance think they can eat gluten without consequence because they don’t have an immediate and obvious reaction to it, over the long-term they could be making a deadly mistake. As a term for a condition, gluten ataxia is a relatively new designation. Ataxia itself is a neurological dysfunction where a person experiences reduced coordination and muscle control. The three basic categories of ataxia are cerebellar ataxia, sensor ataxia, and vestibular ataxia. Gluten ataxia is essentially cerebellar ataxia where gluten has been determined to be the trigger. Gluten ataxia was initially discovered and verified with the examination of the cadavers of individuals who suffered from ataxia in their lives. Upon examination, the same antibodies that are triggered in celiac disease and gluten intolerance were found at the base of the cerebellum, the part of the brain that governs motor control. Further studies indicated that reduced gross motor control could result from untreated gluten intolerance. I expand on this specific topic in a separate lesson: Gluten Ataxia. Too many adults believe that once they reach adulthood, they have a full understanding of their sensitivities and allergies. It is also possible that you’ve either ignored or misread your gluten intolerance symptoms or wheat allergy symptoms. Celiac sprue disease is infamously under-diagnosed and diagnosis takes some study and thought. There isn’t a simple single test to give you an outright answer and the best and most comprehensive research on the matter has only become widespread in recent years. While sometimes a simple blood test incorporating detection of multiple antibodies (Deamidated Gliadin Peptides (DGP), IgA and IgG Antigliadin Antibodies (AGA), IgA Endomysial Antibodies (EMA), and tgG Tissue Transglutaminase Antibodies (tTG)) may indicate whether you have celiac disease, if you test negative you may still experience problems with this potent protein composite. When this happens, you may be suffering from a Non-Celiac Gluten Sensitivity (NCGS). Adults experiencing unexplained joint pain, anemia, infertility or osteoporosis should discuss the possibility of gluten intolerance with their primary care physician. I encourage you to explore my in-depth articles on silent celiac disease symptoms and celiac disease symptoms in adults for more on adult-onset gluten intolerance or gluten allergy symptoms in adults. I hope this helps you gain a basic understanding of gluten intolerance. Please browse additional lessons on this site. They provide multiple perspectives to evaluating different kinds of sensitivities and offer some great ways to handle being gluten intolerant and living gluten free. For example, you might find some fun gluten-free recipes for your new gluten intolerance diet. If you’re new to baking without gluten, check out our comprehensive Gluten-Free Pantry or our first collection of Gluten-Free Bread Recipes. If you’re finding this all intimidating, I encourage you to work through more of my lessons and take the quizzes. Mastering the gluten phenomenon can do wonders for relieving stress and building confidence as you work towards improving your health and increasing your energy. Thank you for reading and please return to the Gluten Intolerance School soon!